Brevemente, per esprimere la soddisfazione dovuta al fatto che ora, sorvolando su un po’ di lavoro interno dovuto alle policy di kdelibs, Nepomuk sta diventando una dipendenza obbligatoria (quantomeno de facto) sia di kdebase che di kdepim, ed è un’ottima notizia per la diffusione del desktop semantico (con buona pace degli ultraconservatori anti-sfruttamento delle risorse del computer). Due righe per sottolineare come da due giorni, o più precisamente dalla revisione 1047226, Virtuoso è divenuto una dipendenza obbligatoria di KDE trunk (e quindi lo sarà anche per KDE 4.4): con il passaggio a questo motore semantico, guadagnamo sia in velocità (è tutto C++, a differenza di Sesame che si appoggia a Java) sia in possibilità, finalmente, di eseguire operazioni di inferenza sulle triple RDF: anche se Virtuoso stesso non supporta appieno tutte le potenzialità offerte da motori dedicati, come Pellet o Fact++, ha comunque una serie di caratteristiche estremamente interessanti. Chissà che finalmente gli utenti la smettano di lamentarsi inutilmente di Nepomuk ed inizino ad apprezzarne le caratteristiche! Innanzitutto, ho scoperto l’esistenza di un gioco da tavolo che ignoravo completamente, anzi che per la verità non avevo neanche mai visto; devo vedere come si chiama in italiano, è una sorta di Age of Empires da tavolo, in inglese credo si chiami “Settlers” o qualcosa del genere. Il piccolo eee si è comportato egregiamente, pur con contemporaneamente Eclipse e VirtualBox attivi, entrambi in compilazione; l’unico dettaglio era il fatto che non mi ero copiato la configurazione di Eclipse dal Dell, così ad un certo punto l’ho abbandonato per KDevelop, che si è comportato abbastanza bene, sorvolando sul numero inguardabile di crash cui è soggetto (e la grafica dell’intellisense, copiata alla grande da Visual Studio); quindi, per il prossimo meeting, devo preparare un setup migliore. Infine, tra il viaggio in treno e qualche momento libero ho prodotto un plugin per Remuco per poter utilizzare il cellulare come telecomando con OpenOffice Impress (tutto scritto in Python): ho realizzato un piccolo servizio DBus, che si collega in locale ad OpenOffice (che è necessario lanciare con una particolare opzione da linea di comando) ed effettua le richieste di avvio/stop di una presentazione, piuttosto che l’avanzamento delle slide; il secondo componente è un plugin per Remuco, che devo ancora testare per bene, che si collega a tale servizio e ne lancia i comandi, in base a quanto riceve dall’applicazione J2ME collegata via bluetooth; di fatto, sto sfruttando l’infrastruttura di base di comunicazione wireless di Remuco a mio uso e consumo (peraltro, ho scoperto che c’è già un plugin per Okular…). So, my first Nepomuk meeting is over (as you will probably get to know from other sources), and here there are my impressions. First of all, it has been a real pleasure knowing Sebastian Trueg and all the other guys (and the only woman, of course!) who met in Freiburg the last weekend; the place was quite cool (especially the fact that the conference room was just below the bedroom floor), and the surroundings were really beautiful. Well, actually for me they were two and a half, because I arrived on friday noon, but anyway they have been surely interesting: I have to admit that I got a little lost in the first day discussion about some ontologies details; at least now I can say that I know something more about the Nepomuk internals. On saturday the use cases discussion about social desktop and how to integrate it with the semantic one continued from the evening before, but we also started developing some things, about which I will tell in a few lines; I especially liked the sunday: we took one of the case studies, and each of us took a piece of the necessay libraries and tools that were missing from current Nepomuk release, with the aim to be able to make that use case real; we didn’t finish it, but it has been interesting and even fun to collaborate with the others with one common target. So what was my part in all this? Well, I will start with the last day’s work: the use case was about allowing users to share metadata about files from a computer to another computer, so the user of the latter would be able to see those files in his searches, and to open them (downloading them on the fly) and add more metadata; anyway, I’m sure other people from the meeting will explain all this with more details. My task was to add a popup menu for Dolphin, so a user can right-click a document and decide to share it with friends; then a little dialog searches all the user’s contacts, allowing him to choose whom to share with and if he wants to be informed about any changes. For now, I have been able to create a popup menu for Konqueror, in the form of a Konqueror plugin library, and later I will add it to Dolphin too (why Dolphin does not read also library plugins? It would be so useful…); what is missing in the plugin is just the final call to the Nepomuk service, of course through DBus, and this will be done in the next few days (and maybe I will blog about it later). 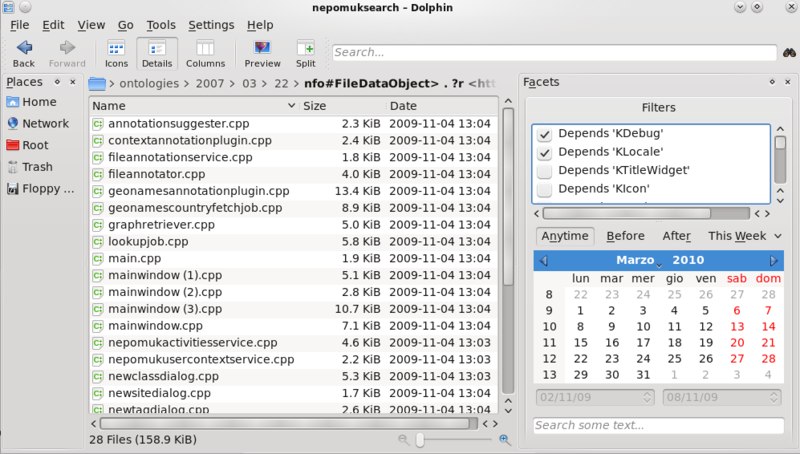 In this workshop I also wanted to share ideas about the smartsave dialog and its current status; for now, we decided to rethink about the filters UI, and put this new UI also in a Dolphin side panel, so users will start to see it and use it, and realize how useful it can be; this side panel may also be able to get into a KDE release easily. So what I did on saturday was to bring the filters panel, as it is now in the semantic open dialog, into Dolphin itself: the integration is still in an early stage, there are still some bugs to be solved, but it basically works; the next step will be to change the way in which filters are shown, and this even deserves a new paragraph. The filter panel will become a complete faceted browsing system, and we decided to reduce filter types to three categories (at least for now): time (today, yesterday, this week, last week, this month…), “rough” document types (documents, images, media…) and tags; probably contacts/people will be the next category to make its way into the panel, but at the current status it is not a priority. In the end, there have been three wonderful days, lots of fun and code and chatting and pizza and things; I really liked the whole meeting, and I hope I will be able to participate to the next one, too.